Want to skip to the results? View the Alkaa website HERE. Thanks to businesses such as Airbnb, a hugely increasing property rental market is growing year on year. There are tenants who own properties and rent them solely through Airbnb, and there are those that rent their own homes for short durations whilst they are way on holiday. The idea of being able to make money from your property to pay for your holiday has caught many property owner’s attention. However, the idea of dealing with tenants, picking up / dropping off keys, arranging cleaning etc scares many owners off. Alkaa is a leader in property experiences and management, handling all of the above. Their portfolio spans across the globe, from San Francisco to Jerusalem. 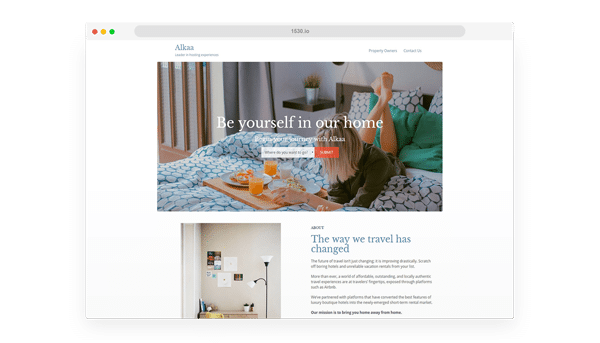 The goal for this website was to build Alkaa’s main marketing channel. A place where landlords and tenants themselves could visit and either rent out their property, or rent a property. Affios took into close consideration the increasing amount of competition in this market. Researching competitors thoroughly to see what they’re doing, what works, and how we could improve the user experience. After a discovery session with Alkaa, we walked away with a clear understanding of what was desired. And after several iterations of a wire frame mock-up, we were off to work! Within just one month, we had wire framed, designed and built the Alkaa website. Mobile responsive and SEO optimised. Alkaa has boasted great success as well as an increase in their property portfolio. To view the Alkaa website, just click HERE.